South Korean chief delegate Kim Young-tak, before leaving Kaesong at transit office in Paju, near border village of the Panmunjom on July 2, 2009. 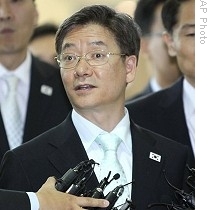 A third round of talks over an embattled joint industrial zone between North and South Korea has produced no progress. The North apparently launched several short range missiles into the ocean even as South Korean delegates were making their journey back from the North's territory. Reports of the latest North Korean missile launches came Thursday via South Korea's Yonhap news agency. The report said North Korea fired two short range missiles off its east coast between 5:20 p.m. and 6:00 p.m. local time. That is about when North and South Korean delegates were wrapping up another round of unsuccessful talks about the Kaesong Industrial complex, located near the North Korean border city of the same name. Military analysts say such short-range launches pose no serious regional threat, and are fairly routine for North Korea. However, Pyongyang's long-range missile test in April, nuclear weapons test in May, and almost daily stream of hostile rhetoric have raised tension in the northeast Asia. North and South Korean delegates met in Kaesong to discuss the five-year-old joint industrial complex, where South Korean enterprises employ about 40,000 North Korean factory workers. Kim Yong-tak, head of the South Korean delegation, says he revisited the issue of a detained South Korean executive known by his surname, Yu. He says the South called on North Korea to provide information about Yu's health and his location. The North, he says, did not provide any response. Yu, a manager in the Kaesong zone, has been detained for three months, isolated from other South Koreans. He is accused of making inflammatory comments about the North's political leaders, and possibly encouraging a female North Korean worker to defect. Kim says the North Korean side simply repeated demands it made after canceling contracts for the zone in May. Pyongyang is demanding the South more than triple workers' pay, and raise rental payments by a factor of 30. South Korean business operators say those kinds costs would make Kaesong a bad investment, compared with setting up factories in Vietnam or China.